Ingrown toenails occur when the toenail is cutting into the adjacent skin, these can be caused by congenital curvature of the nail, improper cutting, too narrow shoes, and foot deformities such as bunions and hammertoe. Toenails affected by previous trauma or fungal infections can also result in ingrown toenails. Ingrown toenails often have redness and pain and if left untreated may become infected. They may be a one time occurrence or recurrent and ongoing. In mild cases, our doctor can often trim the offending nail and alleviate your symptoms. We can also show you some techniques to try to encourage proper nail regrowth. Is your ingrown is infected? 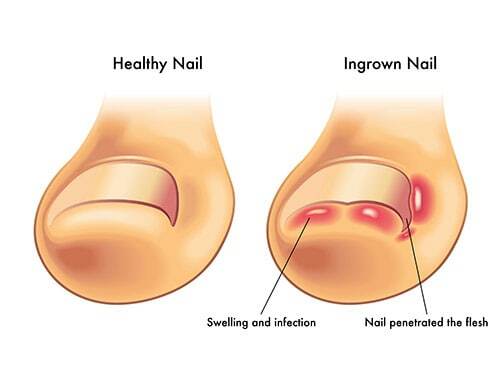 If your ingrown is infected, a minor in office procedure can be performed to remove the section of nail causing your pain and infection. Your toe is numb for several hours and your are able to return to light activity immediately. Patients relate significant improvement by the next day. In the case of recurrent ingrown toenails, a permanent solution is available. Our physician will numb your toe, remove the ingrown nail border and then treat the area with a chemical to stop the nail root from growing. Patient relates very little discomfort after the procedure and are very pleased with the outcome.